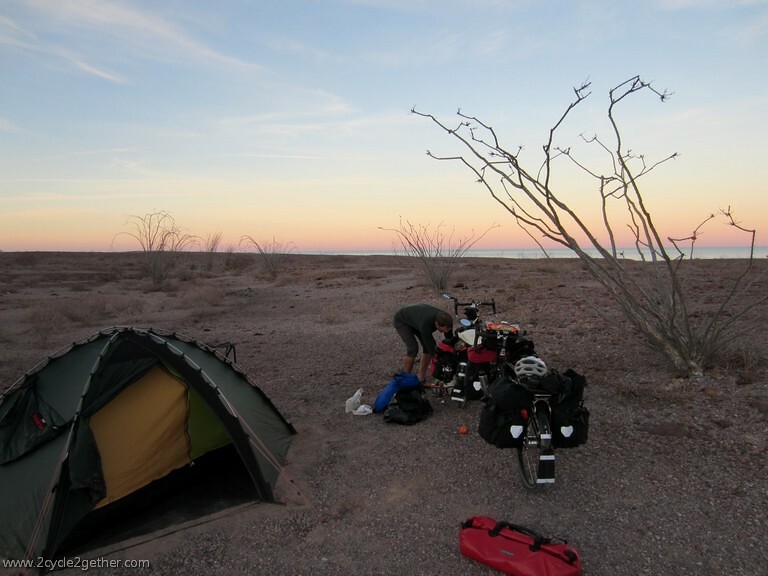 Although we love the privacy that a hotel room offers us we left San Felipe with anticipation rising. Adventure lay before us. 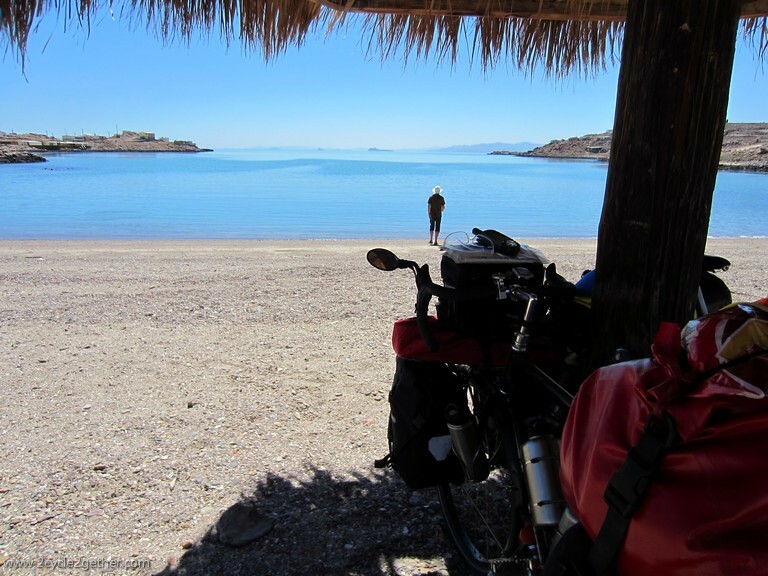 Over the next week we would be riding through some of the most remote and least traveled areas of Baja California, on some of the roughest roads. 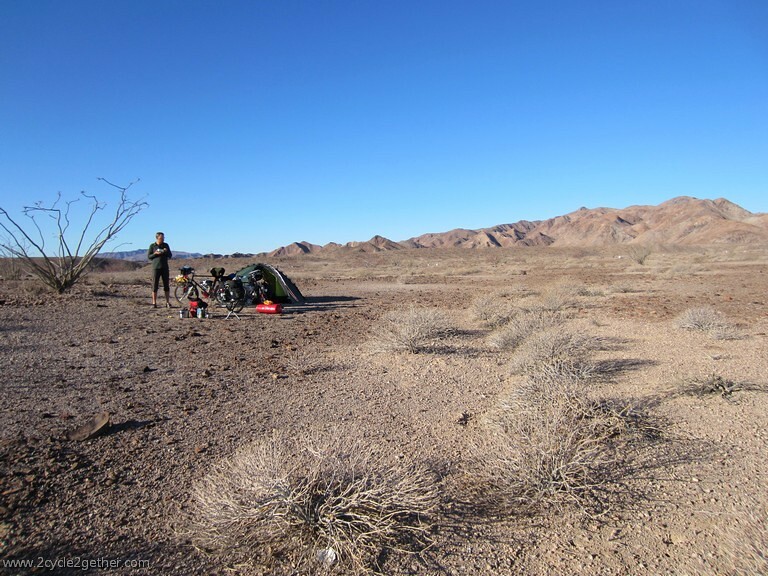 Besides travelling through a couple of small fishing villages that had little in way of supplies, we would be on our own, responsible for carrying all the water and food we would need to survive in the mountains and the desert. 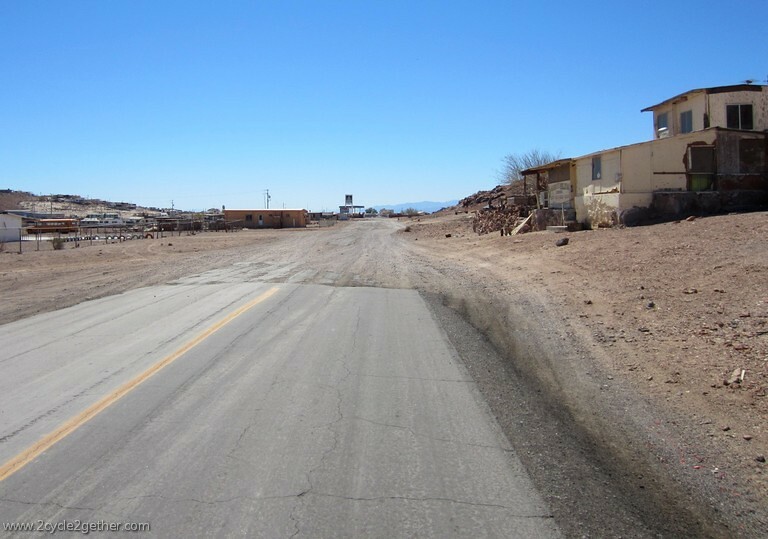 After filling our water bottles and an extra 10 L Ortlieb bag at the local water purification store we turned south once more, riding a deserted, deteriorating and partially sand-covered Highway 5 (locally named ‘Camino del Sur’) out of town. 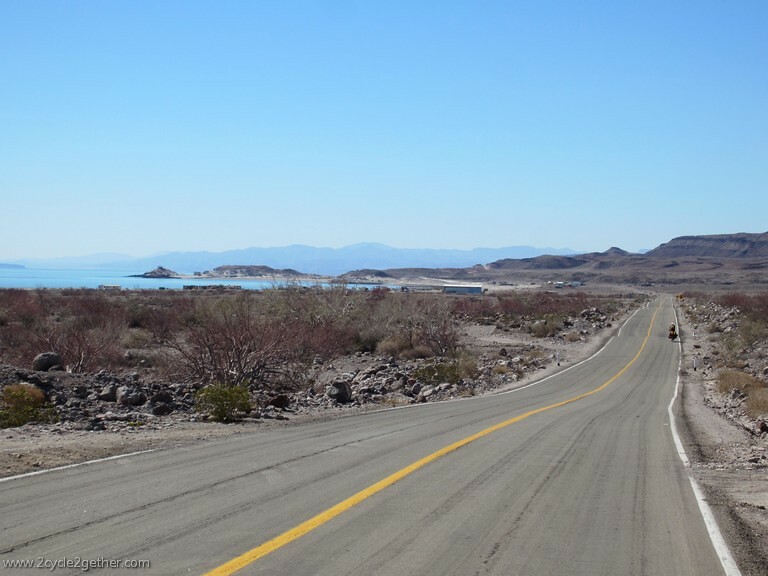 It had been apparent to us through our travels so far that the tourism sector of Baja had taken a blow due to the recession and a backlash over media reports of violence throughout Mexico but it was strikingly obvious as we cycled alongside the Sea of Cortez. One building project after another had been abandoned, only partially finished – someone’s home, a business, condos – all of them having stood naked and exposed for some time from the looks of the sand piled up against their walls. Billboards and signs declaring “Se Vende” (“For Sale”) and listing unbelievably low prices for beach front property tainted views of the coastline. Before all the tourists were scared away people were obviously doing well, expanding, and making plans. The ironic thing is that when we ask both gringos and local people about the reports of violence, every one of them shakes their head back and forth and confirms there hasn’t been any violence in the area. They lament what the misleading reports have done to their community and economic growth. Of course, there are benefits to the recent stagnation of rapid growth. 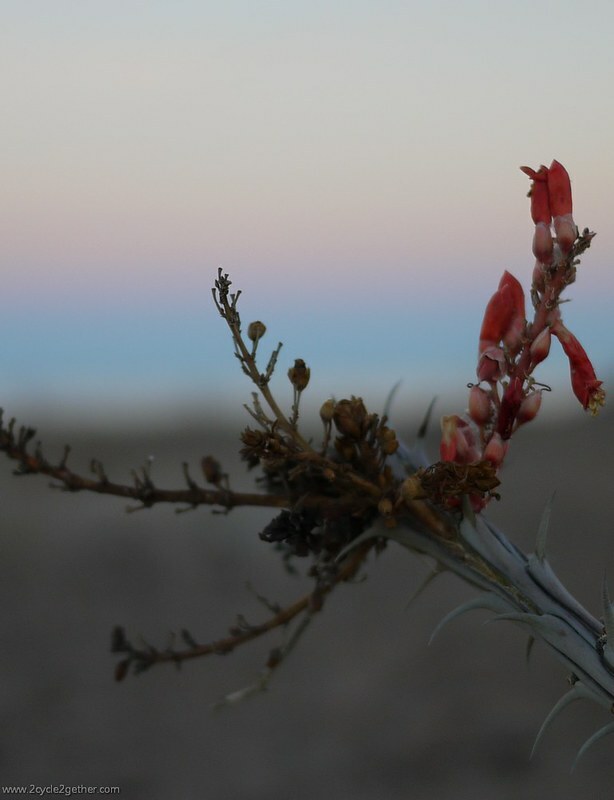 Baja’s unique habitats of islands, coastline, mountains, deserts, plains, swamps and marshes support a staggering diversity of animals and plants, some of which exist no where else on earth. 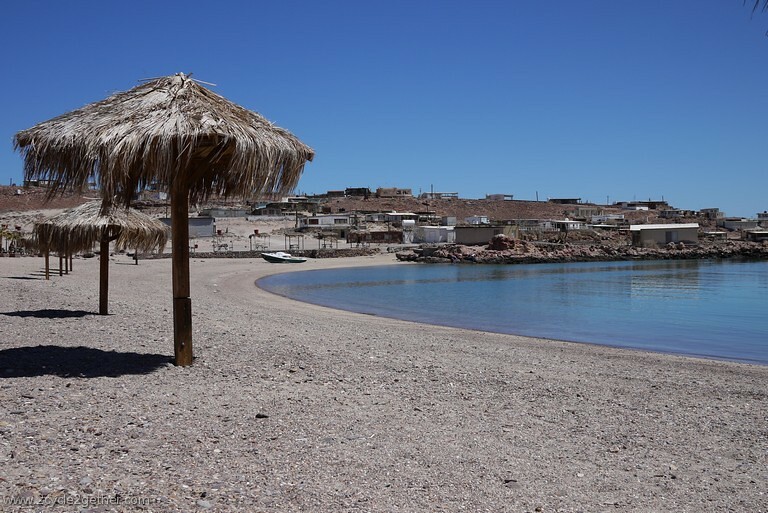 Environmental groups, like Terra Peninsular, would rather preserve the bio-diverse coasts of Baja than build upon them. The failure and halting of the government’s “Tourism Megaproject of the XXI Century” (the Escalera Nautica or Nautical Staircase project was to develop a string of marinas down the coast of Baja to service tourists of the future) and the downfall of the housing boom has opened a new door for conservationists. They’re snatching up large swathes of the currently cheap land for preservation purposes and are working with the government to form protected areas in places where marinas were once planned. One idea we’re glad to see didn’t come to fruition. 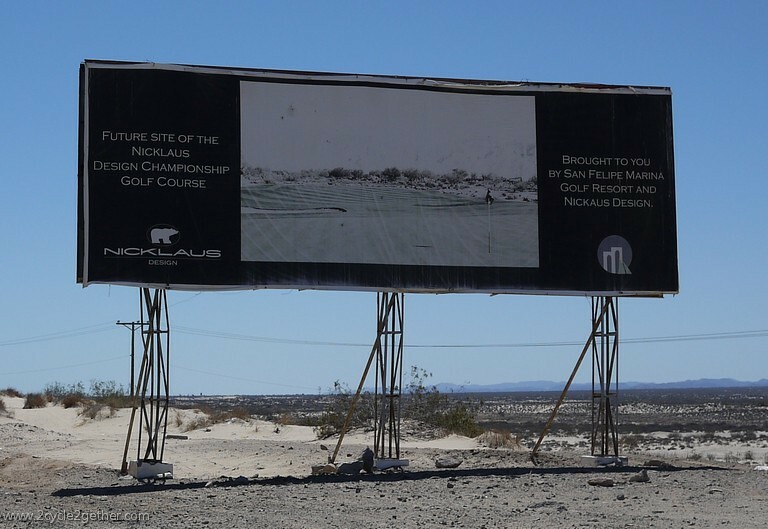 Besides the fact that golf courses are environmentally damaging and cause major health problems (excessive & wasteful use of water, questionable use of land, disturbance of eco-systems and wildlife migration, use of pesticides and chemicals which cause runoff damages and a host of cancers and other diseases) it seems ludicrous to suggest building one on a desert peninsula that is already facing a water shortage. Nothing seems more elitist to us than golfers taking the course while farm animals, fields full of food and people go thirsty. 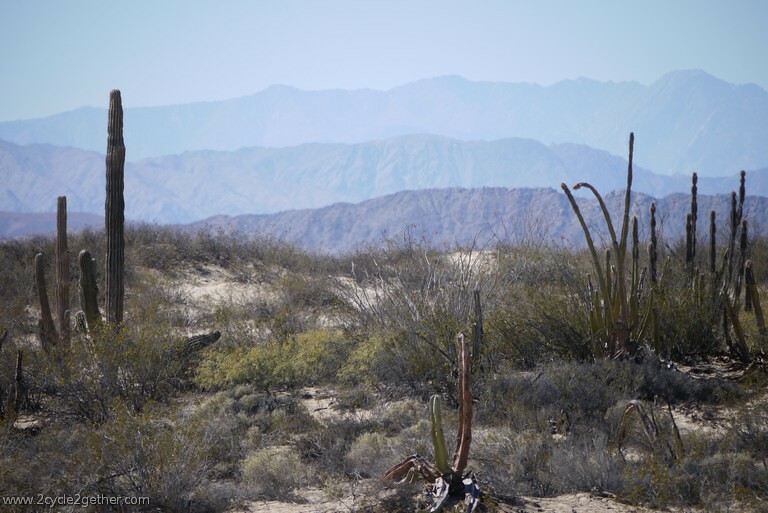 Soon after leaving the outskirts of San Felipe signs of any development and all traffic disappeared and we entered the Valle de los Gigantes, where the cardón cactus can grow up to 60 feet (18 meters) tall. Ironically, the deteriorating road turned into a surprisingly decent road, one we had to ourselves except for a handful of passing vehicles late in the afternoon. We relished riding so freely. 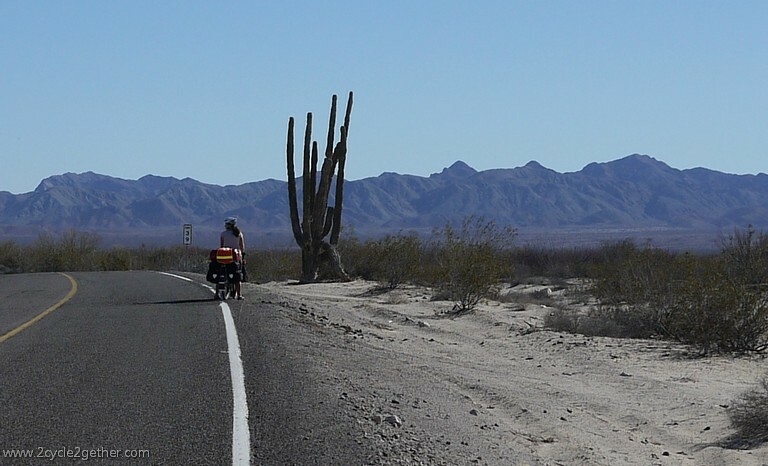 To be able to scan the landscape at leisure without having to worry about hitting a pothole, to ride side by side chatting without having traffic drown us out or push us aside, to relax into our seats rather than skittishly looking over our shoulders for the next oncoming vehicle, and to do all of it with the Sea of Cortez splayed out to our left, the desert to our right and the mountains looming before us – well, it was a dream! Mountains, desert & sea, all meeting in one place. Sheila taking a break next to a cardón cactus. Kai approaching the “Vado”, drainage ditches built in to the roads. They wouldn’t bother cyclists but the marks we saw in the pavement at the bottom of each dip indicates these can be surprises for those who bottom out in them. 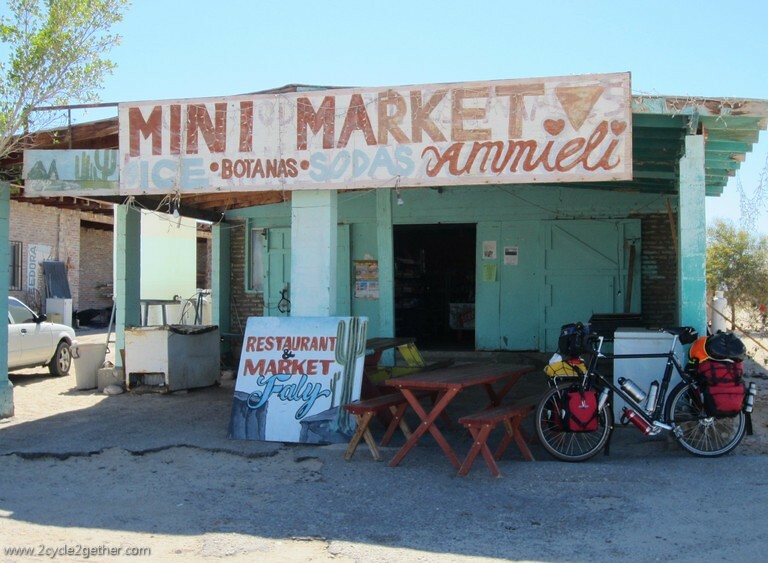 Stopped at this mini-market in the middle of nowhere to fill our bottles before finding a campsite (the water tank is on the left of the porch). 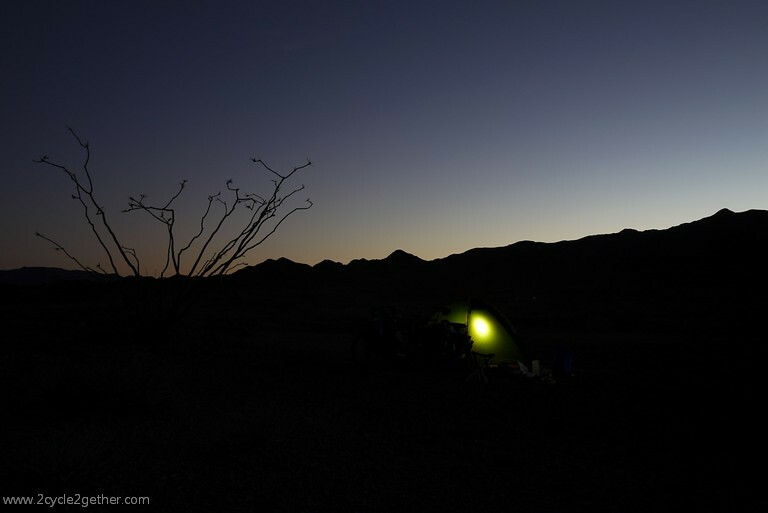 Even though we left San Felipe late in the day we made it a good 43 miles down the road before we started looking for a wild campsite for the night. 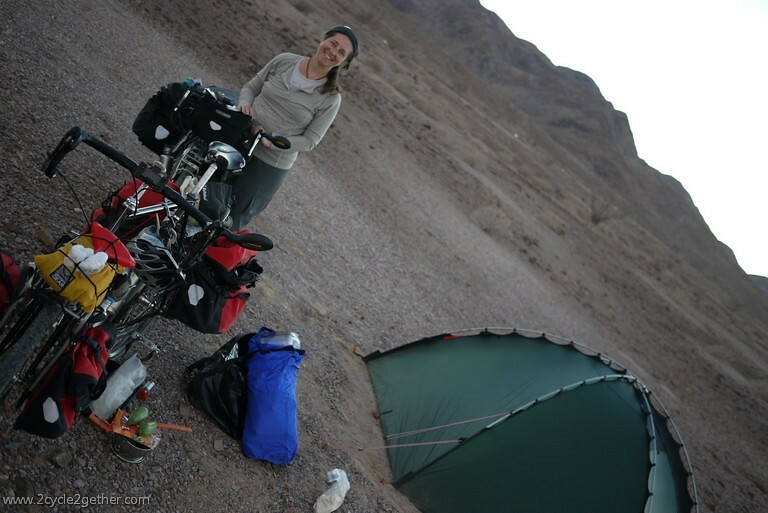 With little tree or shrub protection to provide ideal stealth conditions we opted to take one of two gravel roads leading down to the sea, carefully navigating the mostly sand path to a randomly chosen patch far enough off the main road for us to be overlooked or ignored. Not very “stealthy” but there really wasn’t anything or anyone to hide from out there. Close up of flowers on the tip of a cactus. 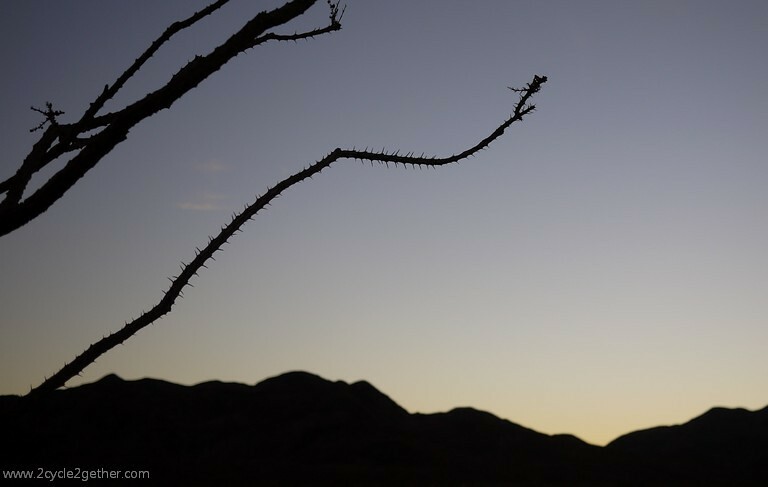 Another view of the same cactus against the fading light. Our camp as the light was fading. Our reward when the day is done = Silence & an Expansive Universe spread before us. We woke at daybreak and took our time eating breakfast and packing up, knowing we were a mere 10 miles from our next destination, the small fishing village of Puertecitos. 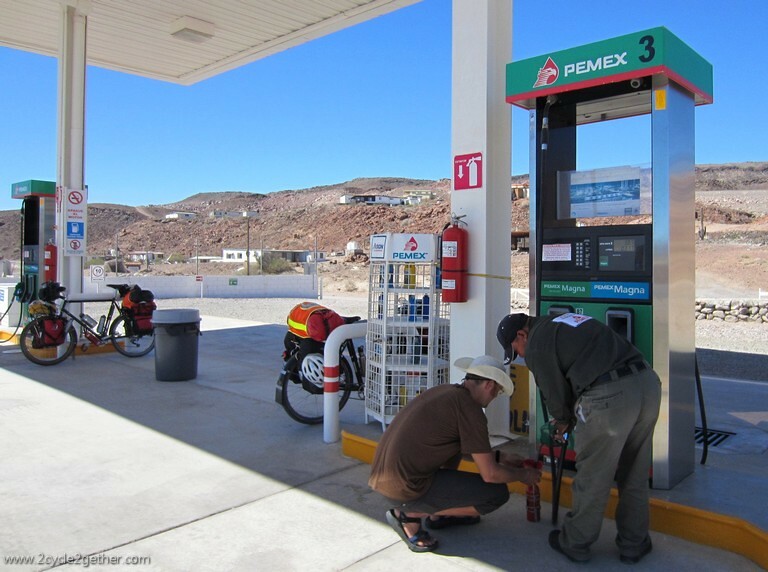 Once we get past the dogs we find the one and only gas station in town and fill our fuel bottles before heading to the local mercado (market), which ends up being a run down shack with a few shelves full of chips, toilet paper and dog food. We find some almost rotting cucumbers in the luke-warm fridge in the corner, and along with some oranges and a couple of sleeves of cookies, we finally make our way to the only accommodation gig in town. The end of the road signals we’ve made it to Puertecitos. The guy at the station looked really bored when we pulled up. 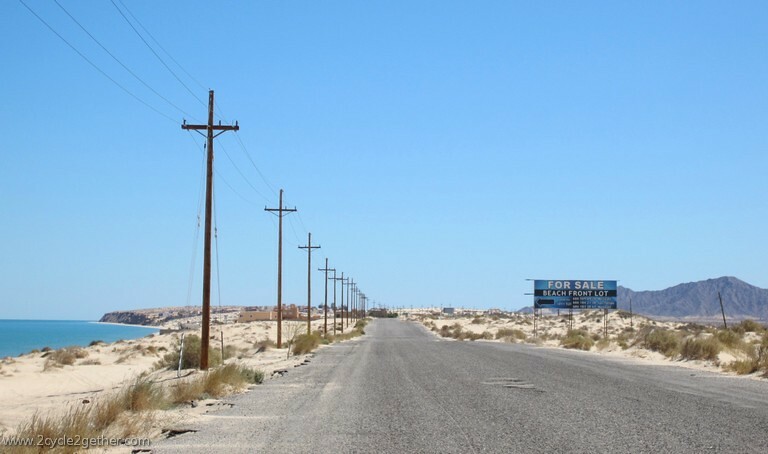 They just sell gas at these stations (no snacks/food). The hotel in Puertecitos looks mostly closed down, three of it’s main buildings sitting empty and unused and only two cars in it’s parking lot but we’re greeted kindly by a man pushing a wheel barrel through the yard. We’re told that the palapas on the beach are $10 and that includes a bucket full of non-potable water for washing. If we want a shower it will be $5 more. 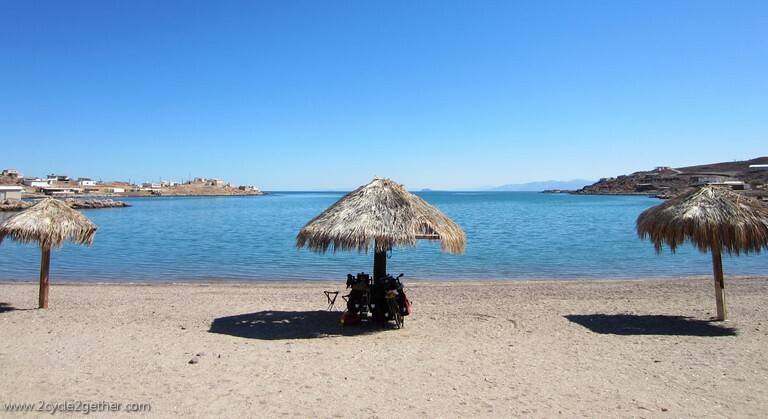 We turn down the shower option since we have our Ortlieb bag, perfectly capable of accomplishing the same thing as a bucket hanging off the top of the palapa would and we most likely won’t be showering anyway, considering we’ll be clean enough after swimming in the bay. As we stake out the best palapa on a deserted beach we are approached by our only neighbor, Alex, whose camper is a Sprinter van he personally converted into a living space for travelling in. It took him three years but after a tour, we’re impressed and take lots of photos to add to our “ideas for interior design” folder for our Tiny House. The rest of the afternoon consists of us lying lazily under our palapa, gazing out at the bay or talking with Alex about travel, with an occasional dip in the water. 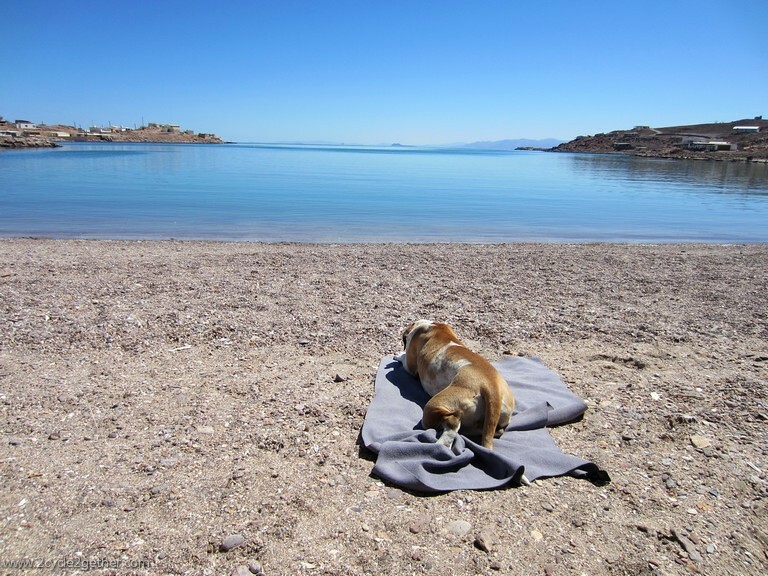 We stake out our choice palapa – smack dab in the middle for premium viewing! This guy was a real lover, constantly looking for the best snuggling position. But he also loved to steal towels and flip flops when you weren’t looking! You’d think it couldn’t get any better, but it did. 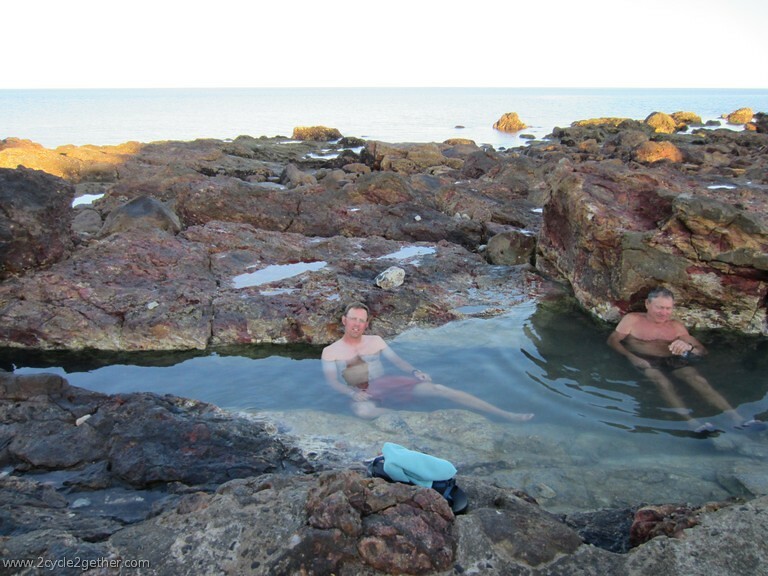 After dinner and before dusk, we walk an easy ten-minutes to the east side of the bay to take advantage of Puertecitos’ natural mineral hot springs. During high tide they’re inaccessible but as the tide goes out, three major pools, one after the other, are slowly revealed. The mix of cold sea water and boiling geothermal pools produces a perfect temperature for soaking up the healing qualities of the springs. As the tide goes out, pools grow warmer, but you move from one to the next (the one closest to the sea being the least warm), till you find your ideal sitting spot. Besides Alex and his wife, Mercia, Kai & I are the only other people there. 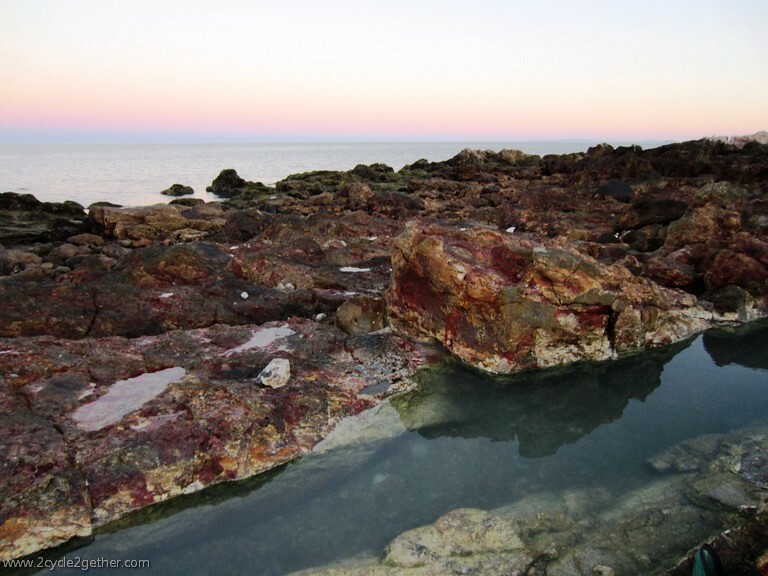 Half-siting, half-floating, surrounded by copper-colored volcanic rock and the soothing sound of bubbling water, I watch pelicans dive for fish as the sunset spreads it’s warm colors over the Sea. I am captivated, trying to take in and mentally record every second, in awe of the fact that I am experiencing this precious place in time. Kai and Alex enjoying the hot springs. My view from the springs. That night, as we snuggle up on our sleeping mats, I release a sigh of contentment. Today has been a good day, a really great day. But just as there are good days on the road, there are also days that require reserves, bargaining, and reminders of why I have become a full-time adventure cyclist. I quietly file today away in my mind, to be pulled out during future desperate times, which unbeknownst to me, happens to be right around the corner. Anxiously awaiting your next post. Glad you enjoyed Puertecitos nice to hear something positive. I have a house there and go when I can. Looking forward to your next story. Thanks for commenting Nita. You’ve got a nice slice of paradise in Puertecitos, that’s for sure. Enjoy. I’m reading your comment 2 years after you posted, but are you still looking for home in the area? 25 years ago my father went down there and built a home 3 miles further down the road from Puertecitos. We have friends that that still own homes down there if you need a contact. I do believe they have portions of the hotel open but I can’t promise that as we didn’t ask. We didn’t look at any of the rooms as we camped in our tent so we couldn’t tell you what condition they are in. Good luck! Very nice narrative. 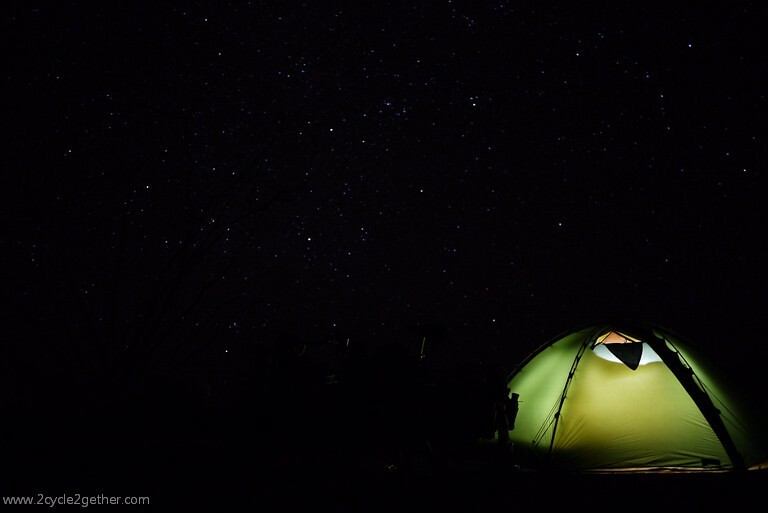 Love the photo of the stars at the campsite. How I miss that area. Haven’t been in years as my family is terrified of MX. Planning a trip with a friend who has a place near Puertecitos this March. Can’t wait. Thanks for the great story of your journey. Made the trip. How awesome. 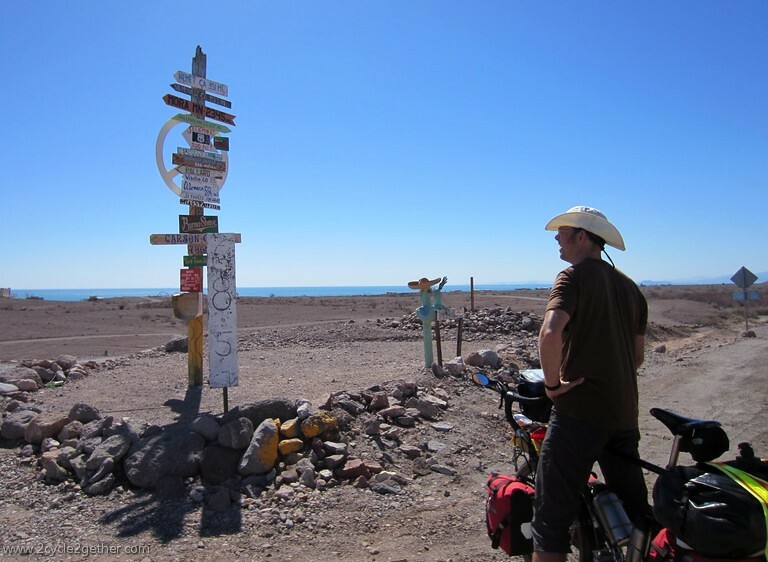 San Filipie has definitely changed but we were down at kilometer 49 where we are still off the grid! 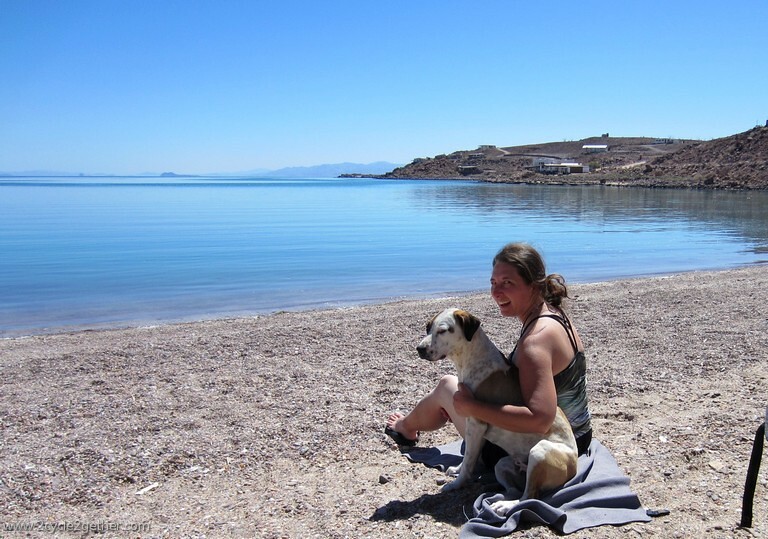 I actuall ended up becoming a partner in a two bedroom house in a small campo right on the sea of Cortez. Now taking the family down for a pig roast in April. Love it! Hope you guys are safe and enjoying your journey. That’s awesome Dave! I’m so glad you’re back and that the family is going to have a chance to experience it as well. Have fun! Enjoyed your narrative. We will be heading that way next week. I was going to leave the camping gear at home, but now we will definitely take it with! Thanks for the info. Thanks for reading and leaving a comment, Leslie. Have Fun!! Sounds like fun Dave! Hope you and Margaret are able to connect.